And “sew” it begins again . . . Zakka 2.0! 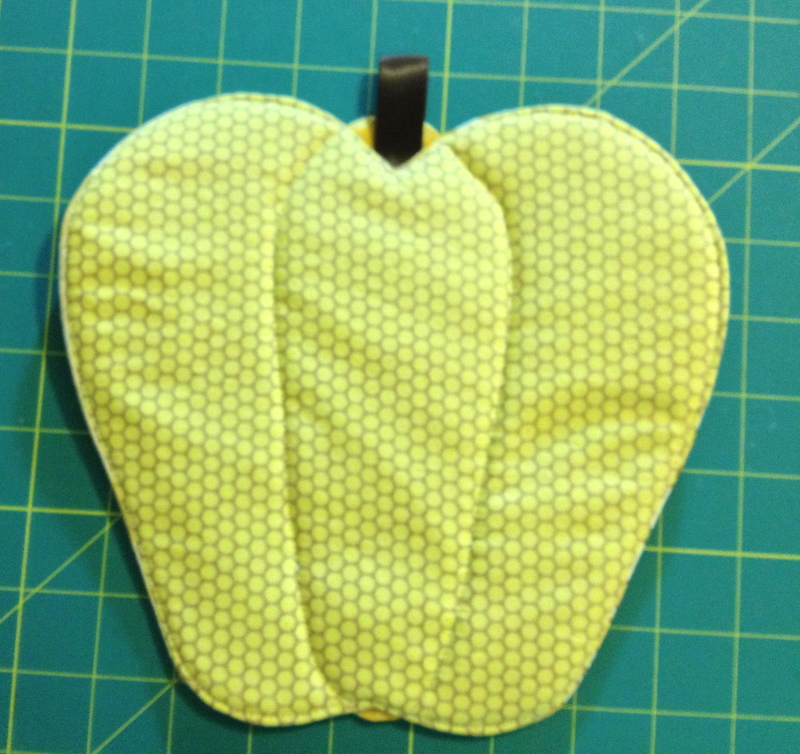 First project from new zakka sew along! 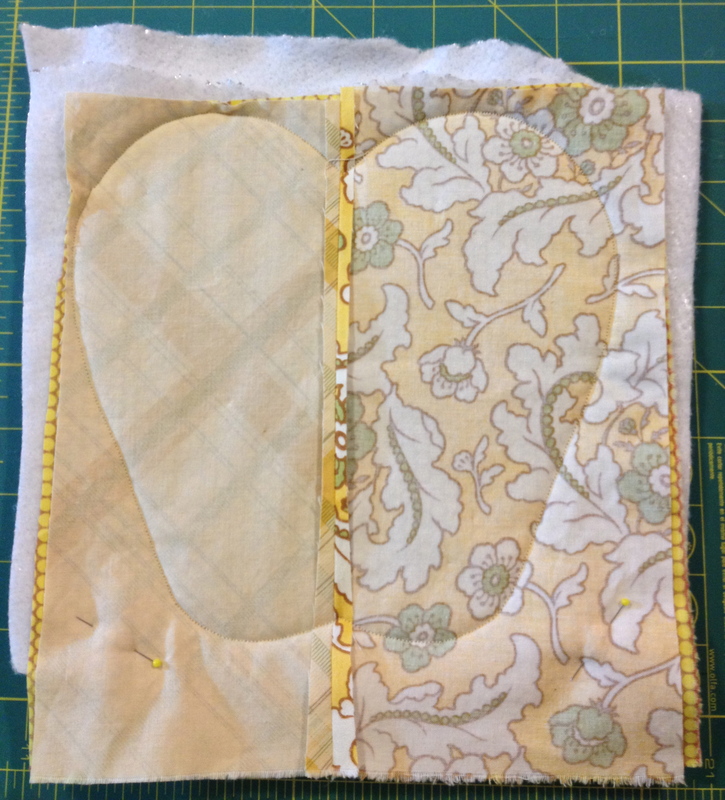 Last year, just as I started blogging, I learned of a sew along for the book Zakka Style which I had just bought at my favorite quilt store. The sew along involved starting at the beginning of the book and sewing a project each week through the entire book. It was hosted by Lindsey Rhodes of LR Stitched who each week introduced a different blogger who shared her experience of making up that week’s project. If you made the item and blogged or posted a picture of it on Flickr, you could link up and have a chance at winning a sewing related “prize”. More fun than the chance to win something, was following the links and seeing all of the similar but different projects that everyone made that week. 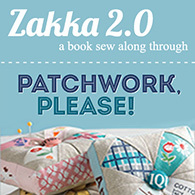 Zakka 2.0 started this week and we are going to sew through Ayumi Takahashi’s book called Patchwork, Please. The book starts with a nice list of Tools and Materials and then a chapter on Techniques. A lot of helpful information is given. Front of pepper hot pad. I love it! When I started thinking about making it today, I knew exactly which fabric I was going to use. I had just bought a bundle of yellow fabrics from Del Ray Fabrics. 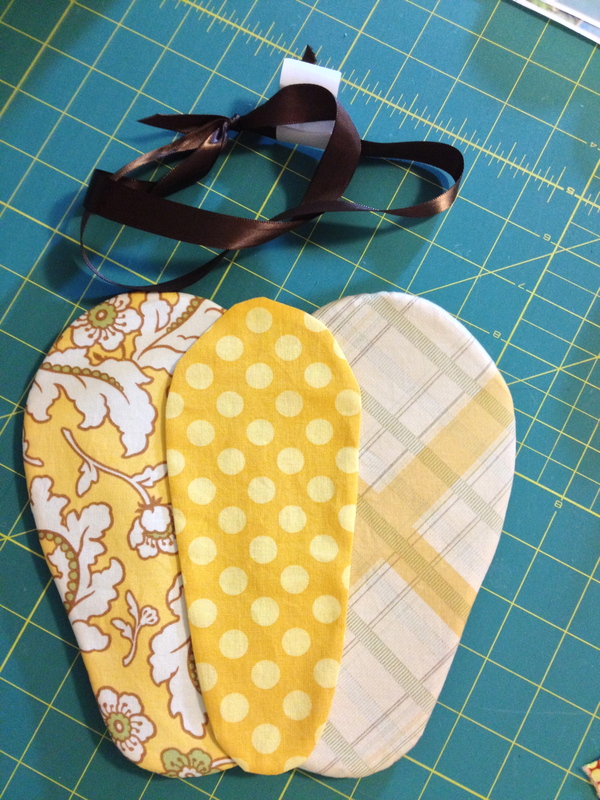 These fabrics came wrapped together in that pretty brown ribbon that was perfect to use for the pepper stem! 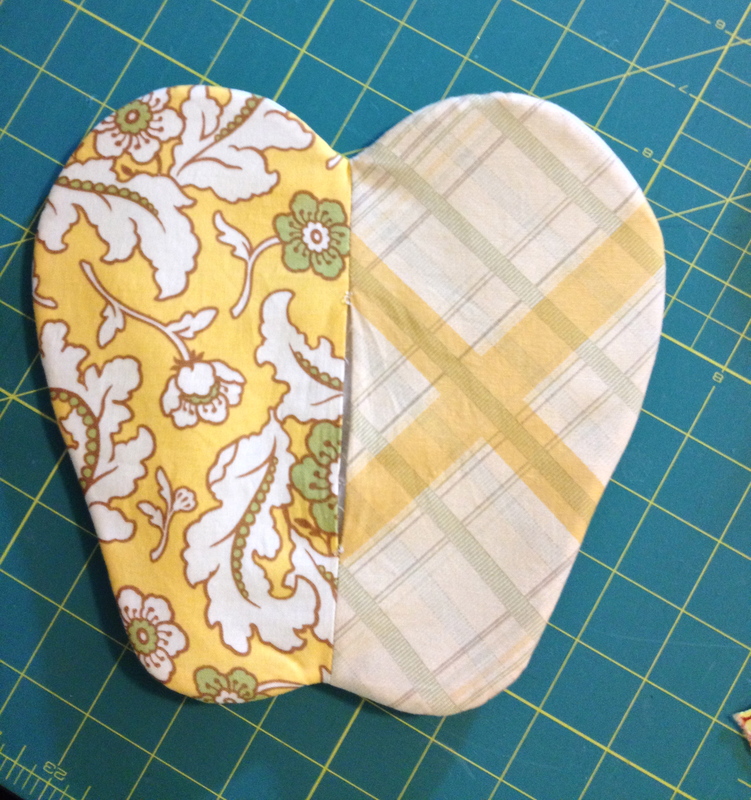 This pattern went together very easily. I took Penny’s advice and enlarged the coaster pattern by 180%. 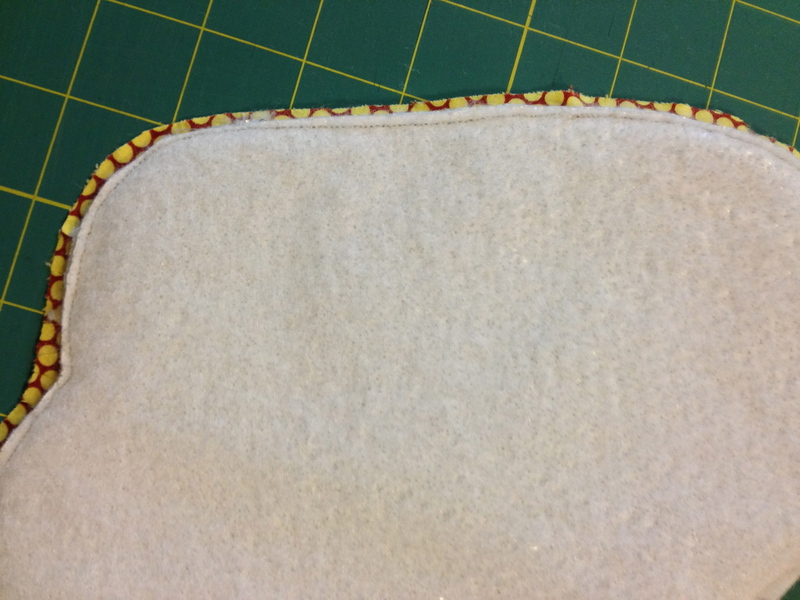 The final hot pad is about 9 inches tall and wide. There are step by step directions in the book for sewing this, but NO pictures of the process. So I had to really read carefully. I guess I must be more of a visual learner because I really missed having pictures of the steps. After enlarging my pattern and picking the 3 fabrics for the front and 1 for the back, I cut the fabric to fit the pattern pieces. 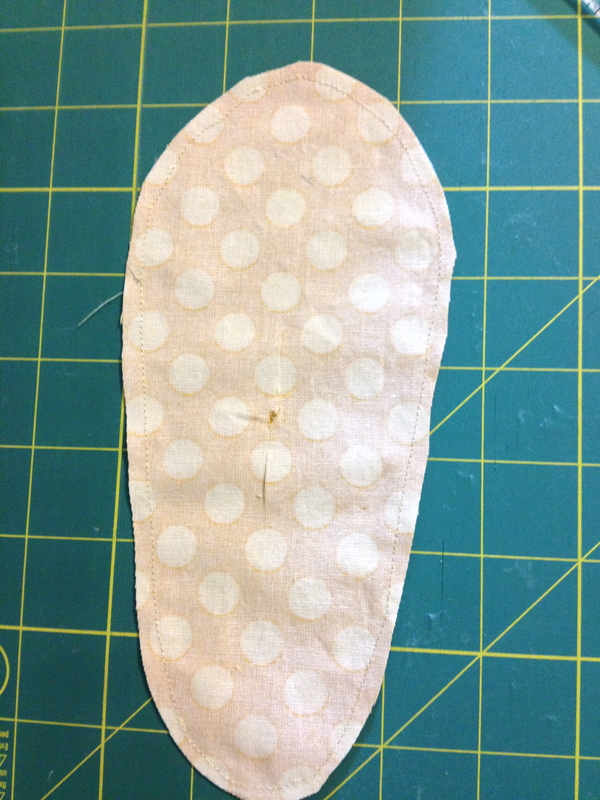 First step was to sew that middle pepper piece (I used polka dot fabric for this). I had already read through quite a few blog posts from those who had made their peppers and linked them to LR Stitched. Amy from Amy made that! . . . by eamylove said she used freezer paper to make her templates. 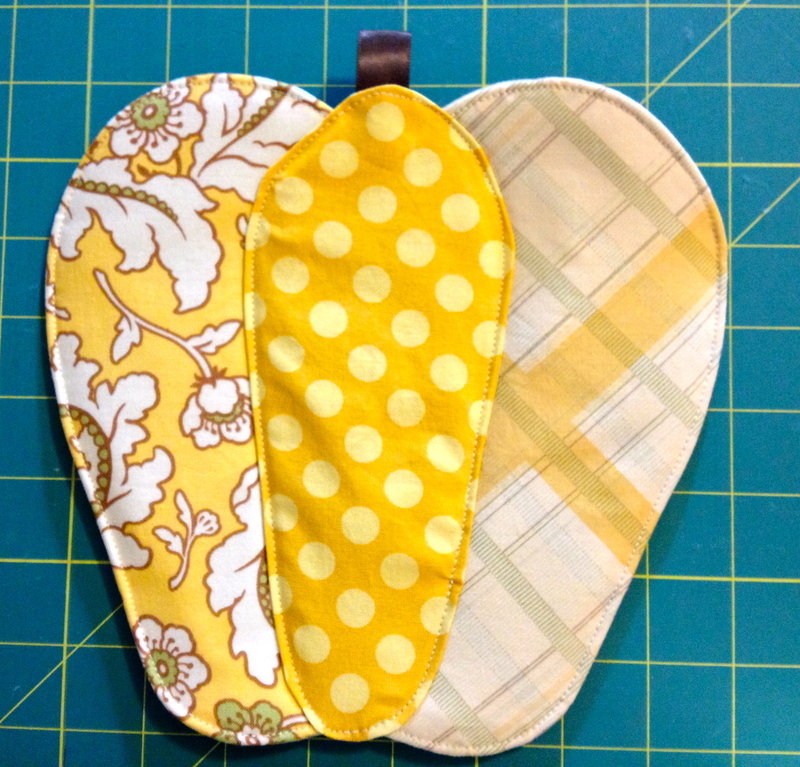 She ironed them on the fabric and sewed around them and this allowed her to use the same pattern for each of the pepper coasters she made instead of tracing the shape on each fabric. This sounded like genius to me, even though I was only making one today. 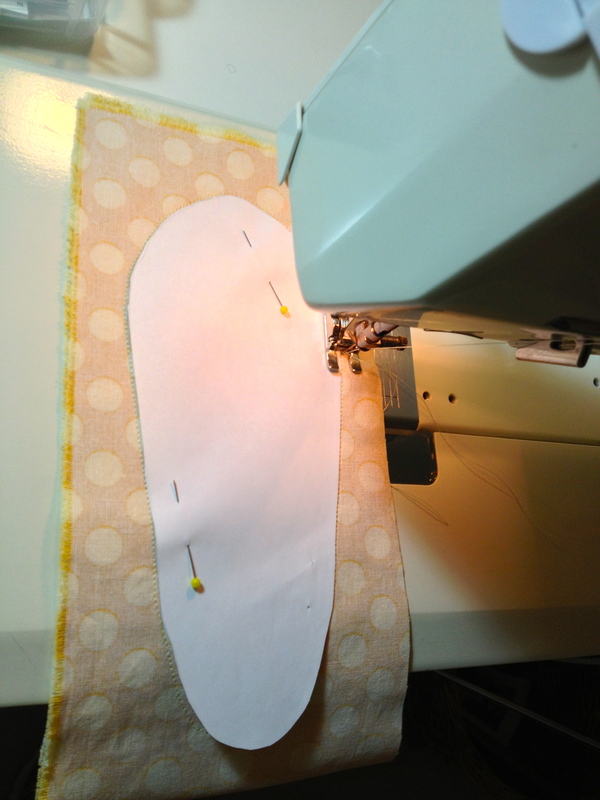 I just pinned the pattern piece on my fabric and carefully sewed around it. 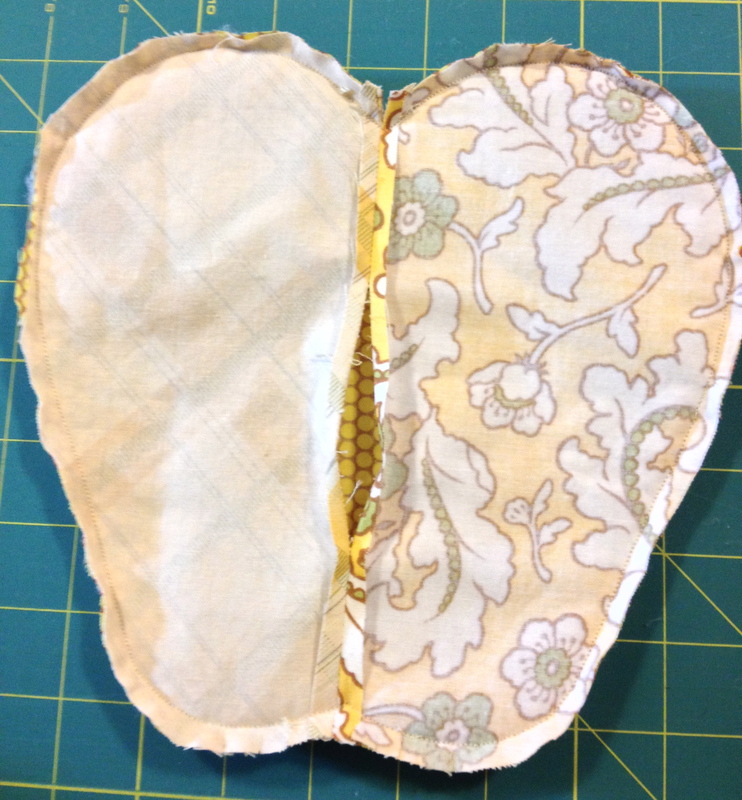 With right sides together, I sewed all the way around the paper pattern. Middle piece trimmed and a slit cut in one side for turning. Since this piece is going to be sewn on top of the larger piece, that hole will never show! Next is to sew the two other fabrics together with a straight seam, press seam open and place the pattern on top with the seam down the middle. Oops! I almost cut that fabric too small. Under this I layered the background fabric and 2 pieces of Insul-bright which is a thermal batting. One piece would probably be enough, but when I set something hot on a pad on my table, I want to make sure it’s not going to hurt the table. 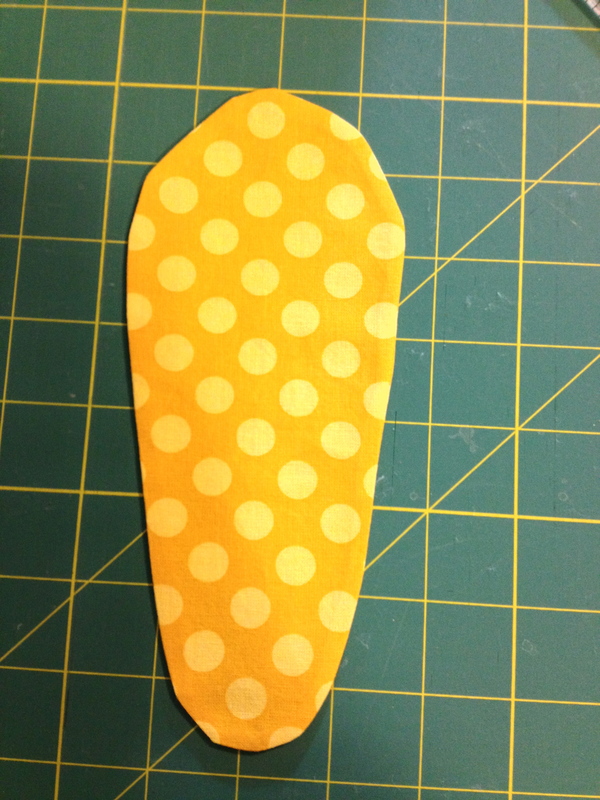 Again, I sewed around the paper pattern. To finish the pepper, I topstitched around the edges and then covered the middle opening in the seam with the pepper middle (hole side down) and topstitched around that, catching the ribbon for the stem in the top. I love this new hot pad! I’m visiting my daughter in Chicago this weekend and will be gifting it to her. I guess I’ll know if she read to the end of this blog post by whether she expects it or not. 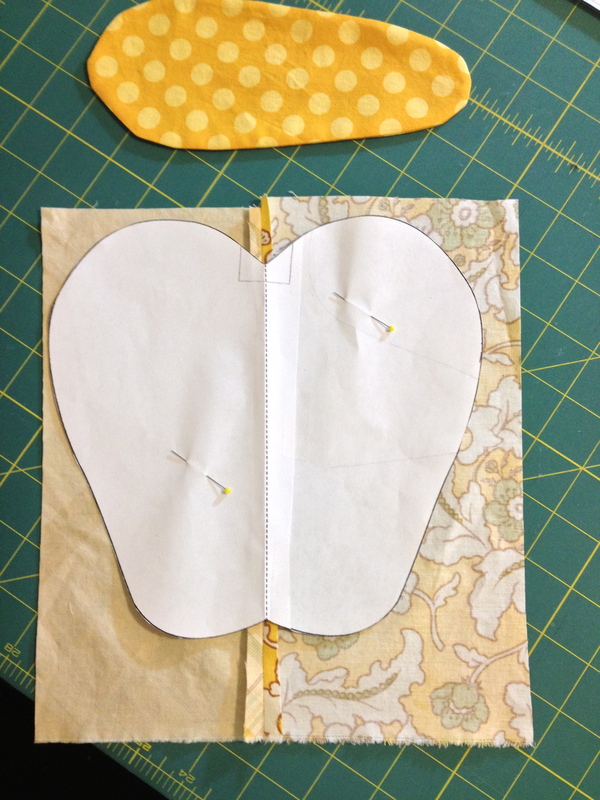 To join in the fun, grab a copy of the book and get sewing. Besides sewing “for the kitchen”, there is sewing. . . for kids, for the home, for going places and for crafting. Lindsey from LR Stitched and Debbie from A Quilter’s Table are the awesome hostesses. I had the pleasure of meeting Lindsey at the Sew South retreat this past spring.